My new garden project. The flowers are coming in a few at a time but they look beautiful for the time that they last. Thanks, I've been taking pictures of each plant as it blooms. They don't last too long. I've have a Queen of the Night cactus that only bloom at night (when it does bloom). Found the dead blooms the next morning. 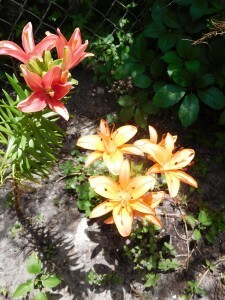 Day lilies last a few days at least. I'm working on adding some iris' to the mix so there is still something there after the lilies are done for the season. I'll have to post some pictures of the other blooms as they appear. I deliberately got a whole bunch of different colors. That will be fun, having little surprises all spring & summer. I understand your joy over the pretty lives. They look so pretty! And each new bloom brings more joy. I guess I'm glad some of them are taking their time. I can enjoy them longer. Love the yellow ones. So pretty! The yellow ones are nice. My favorite is the orange ones. They opened later. I've been taking pictures regularly so I can catch as many as possible.